Every residence hall is also a Christian community in the broadest sense. “All are most welcome” is one of the hallmark mottoes at Carroll, so if you are Catholic, a Christian from another tradition, Muslim, Jewish, Buddhist, Sikh, agnostic or atheist, or from any other religious community, YOU are most welcome as a member of the Carroll family. Feel free to participate in the religious life of Carroll and of Notre Dame as much, or as little, as you choose. The rector is an experienced pastoral minister and is ready to enter into dialogue with you at any time engaging your questions about meaning, faith, and life. We are also blessed to have a priest-in-residence to assist in pastoral care and sacramental ministry. For Catholic Christians the celebration of Mass (or Eucharist) is the center of their spiritual and communal lives together. Each residence hall has a chapel, a place for communal worship, quiet reflection and sometimes just playing the piano. Mass is celebrated in our Chapel of Saint Andre Bessette at 10 p.m. every Sunday, Tuesday, and Wednesday when school is in session. Mass is a wonderful time for the men of Carroll Hall to come together with their brothers. Sunday’s Mass includes music led by Carroll residents. Have an interest in playing music. The ensemble usually rehearses at 9 p.m. on Sundays. Bring your voice or your instrument! Sunday’s celebration is usually also followed by a seasonal late night snack: Sunday Sundaes or Sabbath Cider. Daily Eucharist in the Chapel on Tuesdays and Wednesdays is very simple. At 25-30 minutes, its a parred down celebration, usually without music, and a shorter homily. Not unlike a Zen meditation. Great way to make space for stillness in a very busy week of intense studying and work. Held on Monday nights, night prayer is a very short and simple way to reflect and pray with your fellow Vermin. All are most welcome. 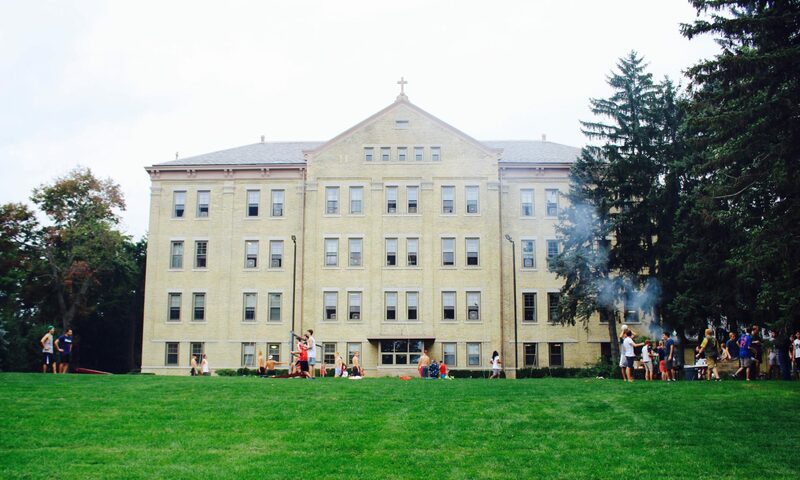 This year Carroll is planning to have a retreat, a time for residents to get to know one another, share about their experiences of faith and life as college students. More information to come. Questions about what you believe or don’t believe? It is our hope that in Carroll you find a non-judgmental community in which to explore them. Guys have meaningful conversations in their rooms, in the den, the living room, the study rooms, perhaps even in the bathrooms! Looking for more? Talk to an R.A., the A.R.s, the rector, the priest-in-residence. … Get the idea? Notre Dame is a campus imbued with what’s called the “sacramental imagination,” a religious commitment to service and justice, and a intellectual curiosity that is never closed to questions. Every new class of Vermin will be taken to the Grotto. Its a replica of the original in Lourdes, France. The Grotto and the Basilica of Sacred Heart are, in many ways, the center of campus. The Grotto is a HUGE favorite of students – of all religious backgrounds – as a great place to go when you need a mini-pilgrimage. Just before (or after) a test. Difficult phone call home. Visit the Grotto; light a candle or just sit in silence. If you need a jolt of organ and high church pomp to compliment the simplicity of Carroll’s chapel, try the Basilica. The grandeur of God will always be available. The Office of Campus Ministry is a tremendous resource to Notre Dame students from every background. Stop by the Coleman-Morris Center (Co-Mo) for ecumenical Christian worship, sacramental preparation, ongoing spiritual direction, retreats, more faith formation and/or catechesis. Whether you are contemplating becoming a Christian, or in need of further spiritual development, or looking for fun ways to meet people of diverse religious backgrounds, Campus Ministry is a great destination.